All wood pellets are not created equal! Other manufacturers of pellet stove wood pellets for heating rebadge and reprice them, then sell the exact same pellets to you as cat litter, chicken scratch and for other purposes. At Pellet Experts, we understand that the raw materials and pellet-making processes must be different for different end uses in order to provide you with the best quality product for your requirements. This is what makes us unique and this is what makes us producers of the safest and highest quality pellets in Australia for your pellet stove wood pellets. We only use the best quality freshly cut pine offsets, without any contaminents or recycled material which could contain waxes, dangerous chemicals or bits of metal and dirt. Our raw materiais are sourced from environmentally responsible timber plantations in NSW, from excess timber waste that would otherwise end up in landfill, and processed in our factory in Cooma NSW. This timber is screened and sorted to ensure only the correct ratio of timber type is used for making our range of pellets. Our NatureHeat Pellets provide you with the optimum pellet for generating and holding heat for the most efficient transfer of energy for your wood pellet heaters. 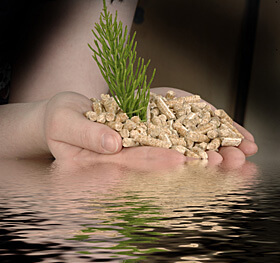 Our pellets have been developed with the correct balance of heat-retaining properties and minimal ash-production. They are specifically developed for pellet heaters / burning and should not be used for any other application. We welcome you to use NatureHeat Pellets in your existing heater or with the NatureHeat Pellet Heater range.